London has some of the best hotel bars in the world - and the great thing is that you don't always have to be a hotel resident to enjoy a martini in one of these glamorous hotspots. So, read the LondonTown.com guide to the best hotel bars on offer throughout the city. This swanky cocktail bar was voted the world's best in 2017. During The Savoy's £220million refit the American Bar was barely touched, ensuring it stayed true to its traditional, sleek design that is synonymous with the iconic drinking destination. This move was clearly a clever one after the bar was voted the world's best in the 2017 World's 50 Best Bars ranking. The white decor, art deco mirrors and fittings, polished piano - used for live American Jazz seven nights a week - and Terry O'Neill monochrome portraits come together to form one of the capital's most stylish bars. Erik Lorincz currently leads the award-winning team of bar staff, who still refer to the legendary Savoy Cocktail Book that is considered 'the bartender's bible'. Written by Harry Craddock, the head bartender in the 1930s, the book contains cocktails such as the famous White Lady, which is made with Bombay Sapphire gin, dry orange liqueur, fresh lemon juice and a dash of egg white. As well as these traditional choices, the bar aims to serve classic drinks that appeal to the modern palate. Sip cocktails on pink sofas at this award-winning riverside bar. A sumptuous, Art Deco-inspired interior designed by Tom Dixon and views over the South Bank, Dandelyan is no unwanted weed. Instead, it's a cut above your average hotel hangout with its green marble bar and dramatic views of the Thames. It's also been named the second best bar in the world in The World's 50 Best Bars ranking and the best cocktail bar in the world at the 2017 Tales of the Cocktail Spirited Awards. On the ground floor of the Mondrian hotel, tucked away at the rear of the building, Dandelyan references the luxurious cruise liners of generations past. And the feature space at the end of the room - pink sofas and gentleman's club green walls - takes its cues from an original 1978 Warren Platner-designed light that the team found in the building at the start of the project. The drinks menu has been created by award-winning bar impresario Ryan Chetiyawardana, A.K.A Mr Lyan, with innovative cocktails and refined interpretations of the classics, taking the botanical wilds of the British countryside and around the world as inspiration. A Jazz Age speakeasy atmosphere with a piano that doubles as a bar. The cocktails in the Bassoon Bar are very good, expensive, yes, but very, very good. Not only that but the bar has a piano which is both a musical instrument, complete with ivories to tinkle, and a bar where drinks can be purchased. Amazing. No surprise that the bar within the luxury Corinthia Hotel London has attracted an A-list clientele - Colin Firth, Jemima Khan, Cuba Gooding Jr, Mariella Frostrup have all stayed here. This is a grand hotel, in fact, the 19th-century building was one of Victorian London's original grand hotels. At the Bassoon Bar this heritage is alluded to in the cocktail list which includes colonial-inspired drinks including the Victorian Moijto, Pimm's Cup and English Tea Punch. Homemade sodas are carbonated to order in the tumbler - which sounds as colonial as it gets. The decor is art deco, courtesy of David Collins (also responsible for the Connaught Bar and Artesian), but it's the cocktails that people will come for, to sip stylish drinks in one of London's most glamorous hotels. As the name suggests, this sophisticated bar's furnishings are universally blue. Located in the old ticket office, this bar striking bar serves cocktails, punches and ales. Located within the St. Pancras Renaissance Hotel, in what used to be the ticket office of St Pancras Station, The Booking Office Bar takes its inspiration from the days when the hotel first opened with punches and drinks recreated from the Victorian era and served in hand%u2010made copper punch bowls. Opened in 1873, the Midland Grand Hotel, as it was originally called, launched at the height of a mixed drink explosion. Alongside revived Victorian cocktails and punches are ales by Meantime beers which arrive in pewter tankards. Open for breakfast, lunch and dinner, the Booking Office's all day menu offers a range of daily specials from braised beef cheeks to Lancashire hot pot. 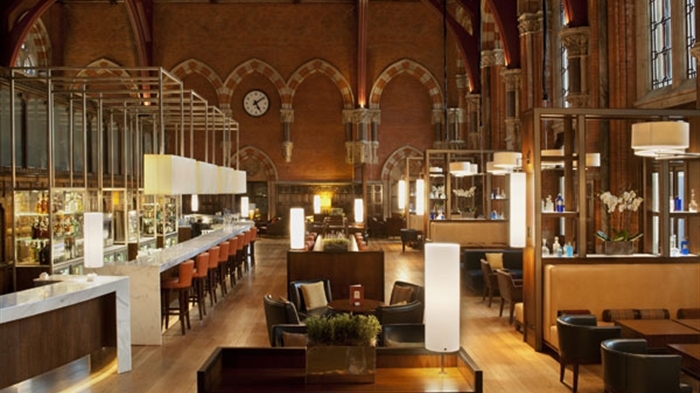 But most striking of all are the dramatically high ceilings of George Gilbert Scott's interior, updated with the addition of a 29 metre-long bar and modern sofas and armchairs. Guardian writer Sally Shalam was impressed by the ornate brickwork and arched windows describing it as, "surely the most inspiring new public space in London". And, if you head up to the platform level bar, you can enjoy al fresco dining while watching the Eurostar come and go. High class cocktails can be supped at this intimate, relaxed and inviting bar. Award-winning bar that oozes style and glamour. If you're after perfection in a glass in an ultra-stylish location then look no further than the main bar at the Connaught Hotel in Mayfair. The bar has been lavished with awards: senior mixologist Erik Lorincz won the Diageo Reserve World Class Bartender of the Year 2010 and Agostino Perrone won the International Bartender of the Year 2010 at the Tales of the Cocktail event, New Orleans, with the Connaught Bar picked up the World's Best Hotel Bar 2010 award in the process. The bar also now offers a signature serve of whisky and bespoke chocolate tasting to enhace the characteristics of the whiskies. It's not cheap (you won't get much change from £30 for two drinks) but given the shimmering platinum silver leaf décor, the superb individual service and the meticulous attention to detail that goes into everything that you sip, you'll agree that being treated like royalty is money worth spent. What's more, the bar snacks are refilled regularly and come at no extra cost. This bar can lay claim to providing the inspiration for James Bond. Any bar which can lay claim to providing the inspiration for James Bond has to make a best-bar list in our books. Ian Fleming was a regular at the stylishly old-fashioned bar at the luxury Dukes Hotel in St James's - and rumour has it the bar's famous martinis (no doubt shaken, not stirred) fuelled the author's imagination when he was shaping his legendary 007 character. Some even say the martinis, expertly made at guests' tables by dapper waiters, are amongst the best in the world. A renovation in 2007 transformed the Dukes Hotel and contributed to the bar's new cool and sophisticated atmosphere, making it one of the area's most popular destinations. Thankfully, the place still maintains its former charm, with ornate furniture and leather chairs the order of the day and old portraits lining the walls. Besides martinis there is also an excellent selection of cognacs, some of which are more than 150 years old. This chic and relaxing bar is the perfect place to start an evening. Named one of the top five hotel bars in the world by the Sunday Telegraph, the Lobby Bar at the chic One Aldwych hotel is renowned for its fresh and inventive cocktails in a superb, airy location. Contemporary sculptures, vast flower arrangements, bespoke furniture, dark oak panelling and a polished limestone floor all combine to make the Lobby Bar a stylish yet unpretentious haven from the hustle and bustle of the West End. Smartly dressed, polite and extremely talented bar staff mix together original cocktails and martinis - some of the best in the capital. Bar snacks include Welsh rarebit, Dorset crab, goujons of pollock and a selection of cheese - while every drinks order comes with a trademark bowl of hot assorted nuts (work the trip alone). The Lobby Bar can get quite busy depending on the schedule of the many nearby theatres and so you may not always get a table - but with double-height ceilings and loads of floor space, you can easily stand in or around the bar without being shunted around the place. Described as "probably the most beautiful hotel lobby bar in London" by the Evening Standard, the Lobby Bar is a firm favourite of discerning drinkers off The Strand. With such a chic and relaxing atmosphere it's the perfect place to start an evening. This exclusive sanctuary possesses one of London's longest bars. A bohemian hideaway that serves delectable cocktails and food. A thing of beauty, The Coral Room breathes new life into The Bloomsbury Hotel. Acclaimed designer Martin Brudnizki - responsible for the interiors at Dean Street Townhouse, Hix and Scarfes Bar - has breathed new life into The Bloomsbury Hotel's reception area with the exceptionally stylish Coral Room. A thing of beauty, the bar sees the original wood panelling upgraded for glossy, vibrant coral walls adorned with cheery illustrations by Luke Edward Hall. At the centre, a sweeping marble bar is sandwiched by comfy bar stalls reminiscent of Cecconi's at The Ned and a gleaming brass drinks display. Glistening Murano chandeliers dangle from the ceilings and plush leather and velvet chairs complete the 1920s aesthetic. The cocktail list sees classics sit alongside contemporary creations while a lengthy 'English Sparkling' menu champions the local product. A sophisticated breakfast is available in the morning while later in the day there's a selection of bar snacks and small plates. An Art Deco hideout, this beautiful bar takes inspiration from the 1920s and '30s. Taking inspiration from the 1920s and '30s - the golden era of cocktails - The Bloomsbury Club Bar is an inviting Art Deco retreat serving delectable classic and contemporary cocktails. Like its equally stylish sister, The Coral Room, the bar sits within The Bloomsbury Hotel and is split into two areas: the main bar, which brings together emerald green bar stools and seats, dark wood panelling and a gleaming drinks cabinet, and a twinkling outdoor space with overhanging greenery and fairy lights aplenty. Aside from the extensive cocktail list, there's also a selection of premium beers, spirits and indulgent bar snacks. Think truffle fries and lobster popcorn. A 19th century cocktail bar from from Michelin-starred chef Marcus Wareing. Following a major redesign, the bar within The Gilbert Scott restaurant reopened as George's Bar in early 2018. Marcus Wareing's latest tribute to the building's original architect, Sir George Gilbert Scott, the bar sees the chef work in conjunction with David Collins Studio to transform the 19th century surroundings. Keeping the architect's original palette in mind, the new design is a more informal affair that takes inspiration from European grand cafes. A two Michelin-starred chef, Marcus Wareing certainly understands ingredients, and working with bar manager, Dav Eames, he presents an exciting new menu inspired by chefs to celebrate the seasons. The menu offers a rotating cocktail of the month, with each one having a story to tell and its own history. The launch cocktail is the Bee Keeper, made with lavender infused Bombay Sapphire gin, Melfort Farm honey, sloe gin, lemon, hibiscus and elderflower. This eye-catching bar takes inspiration from London's most iconic eras and trends. Opened in late 2017, The Perception has taken over the lobby of the W London. Designed by Amsterdam-based firm Concrete, the bar is inspired by London's most iconic eras and trends. Split into seven zones, it has an eye-catching bar at its centrepiece that has a sophisticated cocktail bar design alongside traditional British pub influences. Inventive cocktails are made using unique ingredients like matcha, fresh basil and fig liqueur. The bar also serves a tipsy twist on afternoon tea, a retox brunch and special dining series such as a boldly vegan menu by chef Ravinder Bhogal. Combining her global culinary influences based on her heritage and travels, Bhogal presents a menu that aims to excite vegans and omnivores alike. Dishes include besan fritters with coconut yoghurt and curry leaf and rose, coconut and cardamom doughnuts. Imaginative cocktails are served in quirky surroundings at this upmarket hotel bar. Located within the striking Mandrake hotel, Waeska serves imaginative cocktails in quirky surroundings. A stuffed gazelle dressed as a peacock hanging behind the bar sets the tone for the rest of the venue, which boasts a zany interior of floral armchairs, leather bar stool, mirror topped tables and wacky art. Head bartender Walter Pintus leads the way in the drinks department, serving a menu of botanical based drinks created with homemade syrups and rare ingredients. An upmarket take on the classic British pub, with food by Michel Roux Jr.
Building on the history of the British tavern, The Wigmore is an elegant pub from the team at The Langham hotel next door. The former banking hall has been transformed into a luxurious drinking den with a design by Martin Brudnizki, drinks from the team at Artesian and food overseen by Michel Roux Jr. Here you get great wines on tap, cask ales and craft beers, including The Wigmore's very own house Saison brewed in partnership with Bermondsey's Brew By Numbers, together with cups of punch, house 'hoptails' and a selection of classic mixed drinks. On the menu are hearty British dishes that include a raised veal and ham pie, devilled lamb's kidneys and paprika-glazed short rib with bone marrow crumb. From cheap budget places to stay to luxury 5 star suites see our deals for hotels, including Thistle Kensington Gardens from 72% off.